Please remember in your prayers my dear friend the Priest Pavlo Hayda, of St. Joseph's Ukrainian Catholic Church in Chicago. Father Pavlo was killed this morning in a traffic accident. Father Pavlo leaves behind his wife, Christine, and four young sons, Julian, Zachary, Elias and Dymytrij. May his memory be eternal. And may the Lord comfort his devestated family. Indeed, remember Father Pavlo in your prayers, and his wonderful family. Father Pavlo was an extraordinary priest, and he and his wife served as Executive Directors of the Encounter of Eastern Catholics in Chicago last fall. In addition to Christine and the boys, please also remember his mother and father, Roma and Ihor, who reside in Connecticut and who were so very proud of their son. 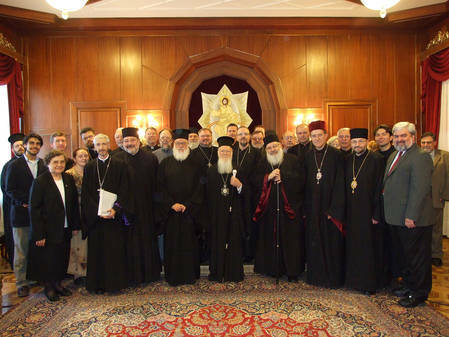 Father Pavlo had attended several Orientale Lumen Conferences, and his mother and father have been close friends and strong supporters of ecumenical dialogue among Catholics and Orthodox, even attending the OL Conferences in Constantinople. Father Pavlo's tragic death will be a tremendous loss to the Eparchy of Chicago, the Ukrainian Greek-Catholic Church, and the entire Universal Church -- he was truly a visionary priest. Vicnaja pamjat and prayers for Father Pavlo and his family. I JUST visited the website of St. Joseph's Church yesterday and thought how wonderful and blessed that parish and whole church are to have such a wonderful priest. I am so sad for his family, his parish, and the church as a whole. May his memory be eternal! And may God comfort those who mourn. May Father Pavlo's memory be eternal! Lord have mercy on your priest Father Pavlo! Please care for and attend to his widow and his sons! Everlasting memory to a true priest of the Lord, a lover of his Church and tradition. 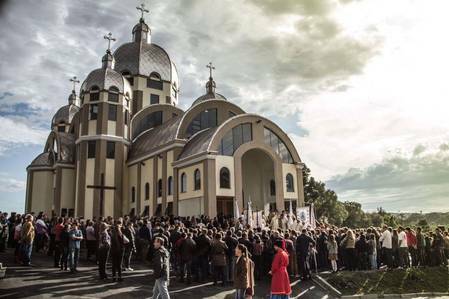 Many prayers for Christina and the boys - a very tragic day for the Ukrainian Greek Catholic Church. Vichnaja pamjat, so svyatimij upokoi, Christe, vichnaja pamjat. May the Holy Theotokos intercede and bring comfort to the entire family. And may his memory be eternal. Vichnaja Pamjat! 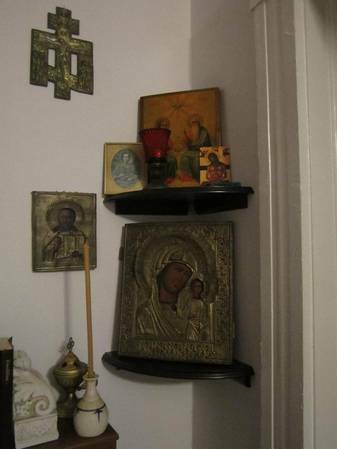 May the compassion of the Theotokos comfort Father Pavlo's widow and their children. May the Lord console his congregation, his associate priest and his bishop as well. And here is the article on this wonderful priest. May his memory be eternal! Pavlo Denys Hayda was born in Battle Creek Michigan on October 22, 1964 to Roma and Ihor Hayda. He grew up with three older siblings, Borys, Marko and Roman. In his youth, Fr. Pavlo was an active member in the Ukrainian community as a memeber of Ukrainian scouting organization "Plast". Fr. Pavlo finished grade school and Fairfield College Preporatory High School in Easton, Connecticut. In 1982 Fr. Pavlo spent the summer in Harvard, studying Ukrainian and preparing for his college studies. Initially having the desire to study engineering, Fr. Pavlo surprised his parents with the announcement that he felt a vocation to enter priesthood. Having come from a long lineage of priests, going back a few hundred years, Mr. & Mrs. Hayda were very pleased to hear that one of their sons wanted to continue the tradition of serving God and His people. In 1982 Fr. Pavlo entered St. Basil�s College Seminary in Stamford Connecticut where he completed his Bachelor of Arts Degree in Philosophy. Shortly after completing his studies at St. Basil�s, in May of 1986, Fr. Pavlo entered the St. Sophia Seminary for Priestly Formation and began his Master�s Studies at Catholic Theological Union in Hyde Park. Before completing his Masters Degree in Divinity in 1991, Fr. Pavlo would take an active part in many aspects of the Ukrainian community, specifically church community. He taught religion at the Saturday School of Ukrainian Studies "Ridna Shkola", actively worked on the committee commemorating the Millennium of Ukrainian Christianity and Ukrainian Youth for Christ Conventions, as well as sang in many choirs. It was through his work at Sts. Volodymyr and Olha Parish that he met his wife Christine. The couple married in May of 1991. Without a free church in Ukraine, there was great difficulty for a married man to get ordained. After a brief visit with Archbishop Volodymyr Sterniuk in Chicago, Fr. Pavlo and his wife accepted an invitation to live and work in Ukraine. Fr. Pavlo and his wife traveled to Lviv, Ukraine, in February of 1992. By the grace of God and the hand of Patriarch Myroslav Ivan Lubachivsky, Pavlo Denys Hayda was ordained to the holy priesthood in St. George Cathedral on March 29, 1992. Ordination at St. George Cathedral is not only significant for Fr. Pavlo because it is the seat of the world-wide Ukrainian Catholic Church, but also because his grandfather Jaroslav Kniahynyckyj was also ordained in St. George Cathedral 65 years earlier by the hand of Patriarch Andrej Sheptytskyj.Within days of his ordination, Fr. Pavlo was assigned to his first parish. St. Paraskevia in Kalynivka, Ukraine, although a small church in size, was a large church in spirit. Unfortunately, this assignment was brief, for shortly before the birth of their first son Julian, Fr. Pavlo returned to Chicago. In October of 1992 Fr. Pavlo was assigned to his second parish, that of St. Josaphat in Munster, IN, where he served the community of approximately 150 families for nearly three years. By July of 1995, change was again in the air. The day after the baptism of their second son Zachary, Fr. Pavlo and his family moved to St. Joseph Parish on the northwest side of Chicago. It is here in 2004, with his close family, dear friends and dedicated parishioners two new members into his family, the twins, Elias and Dymytrij. His service at St. Joseph Parish have been very active, in particular with the re-activation of the Sts. Cyril and Methodius Youth Group the completion of the interior painting of the church and the re-painting of the domes. In addition to parish work, Fr. 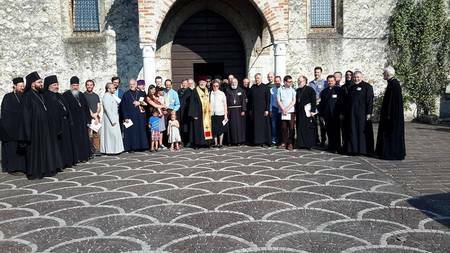 Pavlo has continued to work within the St. Nicholas Eparchy and community. 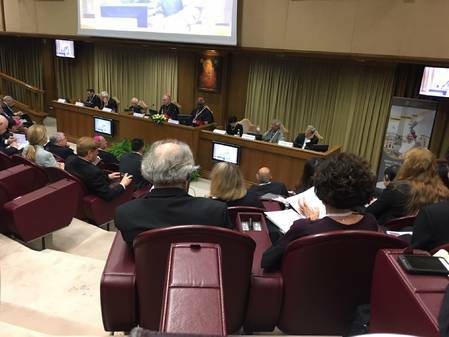 He has worked actively to organize Eparchial Conferences, clergy retreats and has held the position of Presbyteral Council member and Consultor to the bishop. Fr. Pavlo also dedicates his Saturday mornings to teaching religion at St. Joseph Ridna Shkola. Give rest, O Lord, unto the soul of Thy servant who has fallen asleep! Memory Eternal! May Our Lord gather his well-loved servant priest to Himself and comfort all of his family and friends who are in grief and shock. Blessed repose and eternal memory to the servant of God, the priest Pavlo! I am very saddened to hear of Father Pavlo's tragic repose. My prayers for his family and friends and the community! Wow, I was planning to visit his parish this weekend. Prayers for his family and for his flock. May God grant blessed repose to His remarkable servant. I cannot even come close to explaining the shock I am in right now. I have known Fr. Pavlo for many years now and I considered him a truly inflential and guiding spiritual father. I cannot even fathom the sorrow that has overcome the Hayda family and the whole Eparchy. He was a man of God, a man of his family, and a man of dynamic vision. The Ukrainian Catholic Church has lost one of her most faithful and dedicated sons. May he be welcomed to the Fountain of Life and the Door of Paradise. Grant rest and repose to the priestly servant of God Pavlo. Christ our eternal King and God, You have destroyed death and the devil by Your Cross and have restored man to life by Your Resurrection; give rest, Lord, to the soul of Your servant Father Pavlo who has fallen asleep, in Your Kingdom, where there is no pain, sorrow or suffering. In Your goodness and love for all men, pardon all the sins he has committed in thought word or deed, for there is no man or woman who lives and sins not, You only are without sin. For You are the Resurrection, the Life, and Repose of Your servant Father Pavlo, departed this life, O Christ our God; and to You do we send up glory with Your Eternal Father and Your All-holy, Good and Life-creating Spirit; both now and forever and to the ages of ages. You have given us grace at this time to offer You a common prayer together on this forum and have promised that when two or three are gathered together in Your name, that You will grant their requests; fulfill, Lord, the prayers of Your servants, which are for the welfare of the Hayda family, grant your peace to them and the knowledge of Your love and truth in this world and life everlasting in the world to come. Amen.